A number of flight safety ‘human factors’ began to line-up during our usual Sunday flying period at our home field. Time became compressed due to availability of key members. Due to some technical development activity, the mission was delayed until around 1130 and a significant ‘rush’ to get airborne was felt within a final 20 minute availability window. By this time heat was fairly extreme on the field (37℃+). A number of failures were experienced whilst setting up the bungee cord which was then modified ‘on the fly’ and was to be connected to a bungee launch mechanism that had not been tested on a live launch. Our ‘spider senses’ told us that we were about to push our luck. Only a minute or two until the launch, the group ‘called it’ and cancelled the mission before any launches were attempted. It is good practice to maintain perspective on the situation when you fly. In this case it really wasn’t crucial to conduct that mission at that time and too many things hadn’t gone quite as planned in the preparation. Flight Safety experts talk about the holes lining up in the ‘swiss cheese’; those ‘holes’ are all individual events. When those ‘holes’ line up, or happen together, that can amount to enough issues to cause an accident. 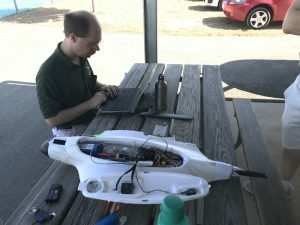 At the bleeding edge of open source UAV development accidents do sometimes happen, but we don’t just accept that crashing is ‘normal’ when we don’t need to. In this case a rushed launch could have caused a heavily damaged airframe. 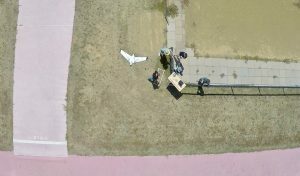 That would have cost money and put back imagery data collection efforts causing longer term issues for our UAV Challenge project. This way, the Opterra lives to collect another day!